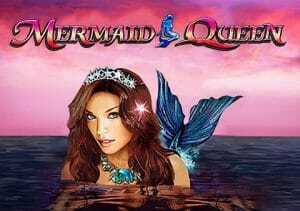 Hop aboard a pirate ship and go hunting for treasure in Mermaid Queen. Created by WMS, it’s a simple 5 reel, 10 payline video slot that comes with wilds that double payouts and a bonus round that awards unlimited free spins complete with a multiplier that can reach 6x. Stakes range from between 10p and £500 per spin. The design in Mermaid Queen is pretty basic – the setting is a wooden sailing ship. On the reels you’ll see A to 9 royal values, treasure maps and telescopes, pearl shells, treasure chests, galleons and a school of dolphins. Land 5 of them in a line and you’ll pocket 75 times your total bet. The pretty boy sailor is the game’s wild – he replaces everything apart from the mermaid scatter. Land 2, 3, 4 or 5 wilds on the same payline and you’ll pocket a payout of 2, 40, 400 or 1,000 times your total bet. If the wild forms part of a winning combination, the payout is doubled. There’s a single feature round on offer in Mermaid Queen but it has the potential to be a good one. The Free Spins Bonus feature is triggered by landing 3 or more mermaid scatters on the same spin. As well as a payout of 5, 20 or 50 times your bet, you’ll also receive 15 free spins. Any winning combination landed during the feature benefits from a 3x multiplier and the payout is trebled. Now, if you get a winning combination with a wild involved, you will essentially benefit from a 6x multiplier. Furthermore, you can retrigger the feature countless times. There’s an old-fashioned feel to Mermaid Queen. The design is nothing to write home about as the imagery is functional at best. The features are equally simple. The wild multipliers certainly help things tick over in the base game. It’s the Free Spins Bonus feature that offers the best winning opportunities thanks to the 6x multiplier which can quickly get the coins moving. You can win up to 1,500 times your bet on every free spin. If you get a wild in that combo, that’s a 3,000 times bet per free spin – potentially. This won’t be a video slot for lovers of complex feature rounds and back story. It can still pack a decent payout punch thanks to the impressive bonus round though. If you’re after a game that delivers a blast from the past then Mermaid Queen offers just that – if you like the pirate themed, Quickspin’s Pirate’s Charm is a good choice.